After being accused of cheating by her ex Rob Kardashian, Rita Ora has taken to Twitter to once again defend herself against claims she slept with her mentor Jay-Z. The extramarital accusations were tweeted at the 22-year-old singer by Georgie Shore star Holly Hagan on Wednesday. 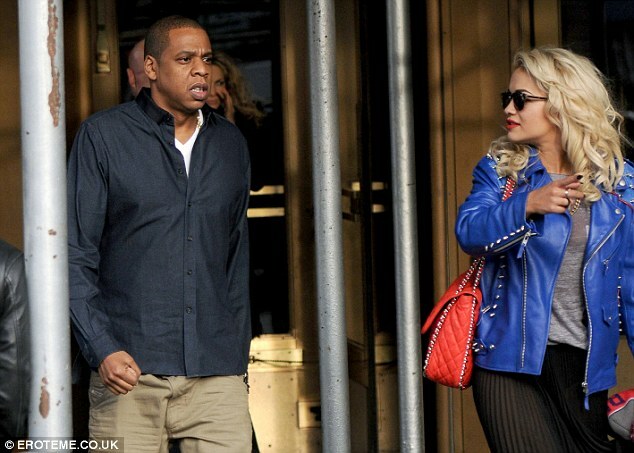 'I've been told to say that Rita ora has been ALLEGEDLY bukin jay z! I repeat ALLEDGELY [sic],' the reality star tweeted. 'Apparently beyonce is denying claims... But if I gt cheated on I'd also deny it #embarrassing,' the flame-haired Hagan wrote before deleting her posts. The How We Do singer, who has been on holiday in Dubai, quickly responded in a series of tweets that were also later removed from her feed. 'I stayed silent on one bulls**t rumour but this one I have to speak,' she wrote. 'Neva eva will any1 includin a red head dum z listin attention seekin whore try talk s**t about me& my family holly wateva da f*k ur name is,' she rebuked. Rita was signed to Jay-Z's label Roc Nation over four years ago when she was just 18 and frequently hung out with the rapper's wife Beyonce. Hagan's claims are not the first time Rita has faced allegations of infidelity. After her nasty split with Rob Kardashian last month, the reality star accused her of sleeping with 20 men after he reportedly 'got her pregnant'. 'She cheated on me with nearly 20 dudes while we were together... But I mean 20?!!!!' he wrote in the wake of their break-up, before deleting the tirade. Rita later fired back in an interview with Glamour magazine, insisting that the couple are still friends and that their relationship severed because of her hectic schedule. 'It didn't work because I was never there,' she said.